Canto Armonico, the local choral group founded in 2000, was directed last night by Simon Carrington in a program built around selections from the 1693 Vespers of Heinrich Biber. They were joined at Boston’s First Lutheran Church by a small instrumental ensemble led by violinist Dorian Komanoff Bandy. Joyce Painter Rice provided a preview of the performance earlier this week. Canto Armonico is, according to its website, “unique among Boston choruses in remaining an educational group: students learn from their more established peers.” The performance proved to be a demonstration of polished choral singing and direction, but it did betray its academic origin in the manner of its presentation, with various soloists stepping forth from the body of nineteen singers, and in the impression it gave of well-coached young musicians who in some cases seem fairly new to this repertory. 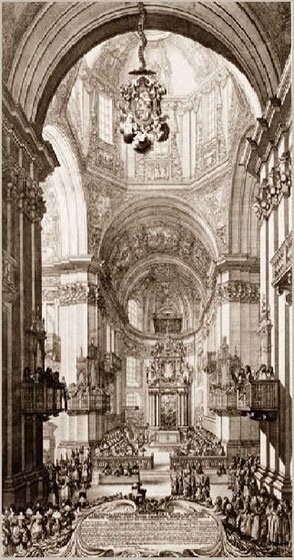 The sanctuary of First Lutheran is a fine concert space, but it is only a fraction of the size of the Salzburg Cathedral depicted in the image that adorned the concert’s program booklet. The famous 1682 engraving by Melchior Küsel aptly represented the program’s theme, “Imperial Splendor at Salzburg Cathedral.” But unlike the massive “Missa salisburgensis” attributed to Biber, whose performance has been connected with Küsel’s engraving, the works heard Friday night call for a far smaller ensemble—one that was better served by the available space, even if it meant forgoing the grand polychoral music promised by the picture. The program of sacred music for voices and strings was organized much like the liturgical reconstructions that became fashionable a decade or two ago, roughly following the order of service of a festive vespers celebrated in the Habsburg empire—especially in the crown lands of Austria, Hungary, and Bohemia—during the late seventeenth century. The main events included five psalm settings by the Bohemian composer Biber, best known today for his violin music but also composer of many vocal works. After the psalms came a hymn, a Magnificat, and another hymn; following seventeenth-century Catholic practice, most of these items were preceded by other compositions that stood in for chanted antiphons, which would have been sung at those points in an ordinary vespers service. The psalms and Magnificat were from Biber’s Versperae longiores ac breviores, a collection of both “longer” and “shorter” psalms and other vespers music published in 1693. Two of the antiphon substitutions were provided by instrumental pieces also by Biber; one hymn was by the Austrian emperor Leopold I, Biber’s sovereign, who was the most talented of several seventeenth-century monarchs who dabbled in composition. Two other items were by Biber’s German contemporary Ruprecht (or Rupert) Ignaz Mayr, and a third was by the Venetian composer Giovanni Legrenzi, who belonged to the previous generation but perhaps was meant to represent the Italian tradition on which Biber and his Austrian contemporaries drew. Two organ toccatas by Georg Muffat, Biber’s colleague at Salzburg Cathedral, completed the program. I’ve gone into some detail on the organization of the program because I’m not sure how clear it was to the hundred or so in attendance. Neither the list of pieces in the printed program nor the rather generic notes by Brian Clark, editor of Biber’s Vesperae, adequately identified all of the 14 individual compositions that were heard. And because the performance was done without breaks or applause, those who were not carefully following the Latin texts, and matching them with the list of pieces, could well have missed the points where, for instance, one psalm ended and another began. I’ve complained previously about performers who insist on making listeners withhold applause until the end of a program. A discrete gesture by director Carrington silenced a few bold souls who attempted to applaud the opening number. Although Clark’s notes explained that this was “not a strict reconstruction of a particular historical event,” I wonder if I was the only member of the audience who at times felt that we were being made to sit diligently through a demonstration of good choral singing, without being allowed to express our enthusiasm for it until the end. Unfortunately, none of this is actually choral music in the modern sense. Rather, as Biber’s original title page and printed parts make quite clear, it is for vocal quartet with optional “ripieno” singers, that is, just four additional voices. As in countless other Baroque works, including Bach’s cantatas, the light scoring of the voices reflects that of the instruments, which here are limited to five or six strings and continuo. Rescoring chamber music for a larger ensemble naturally makes for a more impressive sound, but there are losses as well, even when conducted as sensitively and sung as well as on Friday night. The most serious problems in this music come from the repertory itself, which comprises functional service music. Habsburg church pieces can suffer from a certain sameness, and in these late works the violinist Biber’s imagination for vocal writing rarely matches that revealed in his earlier instrumental music. A counter-Reformation aesthetic favoring clear presentation of the words lives on in this music, which, however, tends to lack the vivid pictorial effects and textural variety characteristic of earlier Baroque writing, such as the famous 1610 Vespers of Monteverdi. In more grandly scored works, such as Biber’s Vespers of 1674 for thirty-two vocal and instrumental parts, the “imperial splendor” alluded to in the program title can be a pleasant distraction from what is sometimes a fairly workaday demonstration of Baroque musical rhetoric. Confident soloists experienced in this repertory can bring rhetorical force or elegance, as appropriate, to the occasionally stiff or ungrateful vocal lines. But otherwise the construction of the music out of little fragments, dutifully setting forth one line of text at a time, can grow wearying. Carrington’s solution is to use dynamics, tempo, and all the other resources of a good modern choral director to bring out such contrast as one can find in this music. All in all, it worked on Friday night—but I was always conscious of being present at an artfully shaped choral performance. This was especially true in the doxology at the end of Leopold’s hymn, where I’m afraid that the over-emphatic jig rhythm merely revealed to me the amateur composer’s lack of subtlety. The lively final verse and closing doxology of Biber’s Magnificat, with its catchy triple meter, displayed the choir’s virtuosity, eliciting appreciative exclamations from the audience, but it struck me as just a hair too fast, attracting attention to itself as display. Of the various solo quartets heard during the evening, the strongest was that in Biber’s Magnificant, in which I was particularly struck by Stephanie Kacoyanis’s rich alto voice and Ian Pomerantz’s emphatic bass. Claire Raphaelson was the capable soprano soloist in Mayr’s “Sancte Maria,” a work whose vivid writing stood out from the rest of the program. The little-known composer evidently continued to cultivate the rhetorical urgency that one hears in earlier seventeenth-century sacred works by Italian composers such as Monteverdi and Strozzi. The vocal numbers were accompanied ably by the ensemble of two violins, two violas, viola da gamba, and violone, although the violin obbligatos were sometimes less audible than they might have been with a smaller choral complement. On the other hand, they occasionally over-balanced the solo singing. Catherine Liddell was the reliable continuo theorbist. Two instrumental pieces by Biber, both early works, demonstrated the composer’s inventive writing for strings. Unfortunately, Sonata III for six strings and continuo from the composer’s 1676 collection seemed insufficiently rehearsed, and its remarkable succession of sharply contrasting sections remained a patchwork, although individual sections, including a fugue for the four lower parts and some blazing passagework for the two violins, were effective. The fifteen Mystery or Rosary Sonatas are difficult to bring off in live performance on account of their scordatura: the re-tuning of the violin to produce otherwise unobtainable sonorities. Leader Bandy did a creditable job with the second work from the set, which depicts the Visitation (Mary’s journey to see Elizabeth, mother of John the Baptist). But this is not one of Biber’s most engaging compositions, and Bandy’s legato approach seemed to forestall the more incisive sound or rhythm that might have energized the piece, especially in its one dance movement, an allemande. Muffat’s two toccatas were cleanly played by Bálint Karosi, organist of First Lutheran, although they would have made more of an impression on the church’s splendid Richards, Fowkes organ. Here they were played on the same little portative instrument on which Karosi furnished a continuo accompaniment for the rest of the program. The pedal (bass) notes lacking on the instrument were supplied by David Miller on the violone, a stopgap that proved surprisingly unobtrusive. Still, it was strange that the program ended with one of Muffat’s toccatas. Muffat is an important composer, but it was difficult to focus on Karosi’s performance of Toccata II, played with considerable sublety on the small instrument while the entire choral ensemble remained standing after singing Legrenzi’s “Alma redemptoris Mater.” It was equally odd that Legrenzi’s work, which lacks string parts, should have closed the vocal portion of the program (nor was its transparent Venetian texture particularly well served by choral performance). I also wondered about the decision to use, even here, Germanic pronunciation of the Latin text, which in its original performances was likely sung by Italian soloists, at Salzburg or Vienna as well as in Venice. I was nevertheless grateful for the opportunity to hear some rarely performed music, imaginatively programmed. Canto Armonico will have fulfilled its purpose if some of its members go on to explore further the repertory from which these pieces were drawn.